The immediate impetus for the Fourteenth Amendment was the close of the Civil War and the end of slavery -- and the origination of civil rights issues accompanying the emancipation of the slaves. The amendment, which overrode the Dred Scott decision of 1857, made all people born or naturalized in the United States citizens of the country. 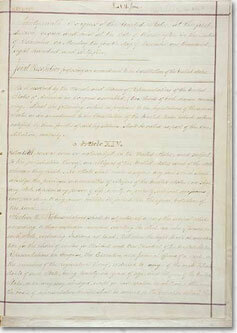 Significantly, it also placed three new limitations on state power: "No State shall make or enforce any law which shall abridge the privileges and immunities of citizens of the United States; nor shall any State deprive any person of life, liberty, or property, without due process of law; nor deny to any person within its jurisdiction the equal protection of the laws." Beginning in the 1920s, the Court began interpreting the amendment to mean that many of the protections specified in the Bill of Rights apply not only to the federal government but also to the states. Section 1. Citizenship Defined All persons born or naturalized in the United States, and subject to the jurisdiction thereof, are citizens of the United States and of the state wherein they reside. No state shall make or enforce any law which shall abridge the privileges or immunities of citizens of the United States; nor shall any state deprive any person of life, liberty, or property, without due process of law; nor deny to any person within its jurisdiction the equal protection of the laws. Section 2. Apportioning Representatives Representatives shall be apportioned among the several states according to their respective numbers, counting the whole number of persons in each state [excluding Indians not taxed]. But when the right to vote at any election for the choice of electors for President and Vice President of the United States, Representatives in Congress, the executive and judicial officer of a state, or the members of the legislature thereof, is denied to any of the [male] inhabitants of such state, [being twenty-one years of age] and citizens of the United States, or in any way abridged, except for participation in rebellion, or other crime, the basis of representation therein shall be reduced in the proportion which the number of such [male] citizens shall bear to the whole number of male citizens [twenty-one years of age] in such state. Section 3. Disability for Insurrection No person shall be a Senator or Representative in Congress, or elector of President and Vice President, or hold any office, civil or military, under the United States, or under any state, who, having previously taken an oath, as a member of Congress, or as an officer of the United States, or as a member of any state legislature, or as an executive or judicial officer of any state, to support the Constitution of the United States, shall have engaged in insurrection or rebellion against the same, or given aid or comfort to the enemies thereof. But Congress may by vote of two thirds of each house, remove such disability. Section 4. Public Debt The validity of the public debt of the United States, authorized by law, including debts incurred for payment of pensions and bounties for services in suppressing insurrection or rebellion, shall not be questioned. But neither the United States nor any state shall assume or pay any debt or obligation incurred in aid of insurrection or rebellion against the United States, [or any claim for the loss or emancipation of any slave]; but all such debts, obligations and claims shall be held illegal and void. Section 5. Enforcement The Congress shall have power to enforce, by appropriate legislation, the provisions of this article.